POLL: Adding ramps to a MC themed map. Discussion in 'Mapping Questions & Discussion' started by Davve, Feb 27, 2013. Should I add ramps to the hills? I am constructing a Minecraft themed TF2 map. If you were to play this map, would you appreciate the addition of ramps to some hills, to eliminate the need to jump on top of them? This is demonstrated in the image below. They will obviously be invisible. Good or bad idea? Vote above! Jumping is always annoying, so yeah these stair things are a good idea. Just don't make them that long, you'll seem to float in the air. Make them 16 units long at most. congratulations. You have invented clipping. Wasn't that already ruined by the fact that there is a round bomb on the minecart? My suggestion would actually be microstairs. Make the clip stair only 1 unit thick (or thicker if you want, but 1 would work) and then you'll walk up the block as if it was a smaller stair since with microstairs you traverse the distance so fast you don't notice. I'll be honest, in my past attempts to nail down how best to design a Minecraft-themed map, I've realized that the best approach is usually to just forego lots of topographical striations and mainly use man-made structures for height variation. Minepit is a good example of a map that did this well: With the exception of a few cover-sized hills here and there, the ground is all on one level, and the higher surrounding land even makes it look like it was intentionally dug out that way. And yeah, it's limiting in what sorts of layouts you can build, but the challenge is half the fun of it. Consider that all but the first hill in Badwater Basin already fits the bill, and it's not hard to imagine a map with plenty of height variation provided entirely through staircases. But if you're set on the layout you've got, then yeah, the invisible mini-step is a reasonable alternative. It's what I used to make the stairs climbable when I was toying with Minecraft theming—I'm picky about scaling being accurate, so I made my blocks 48 units high, meaning even steps were too tall to climb normally (and also too tall for a real clipping ramp to look natural). or add a 45° grass-covered ramp, or a grass half-slab and then clip it so it becomes impossible to get stuck on. A side-note though, that's a very long and straight section of track. 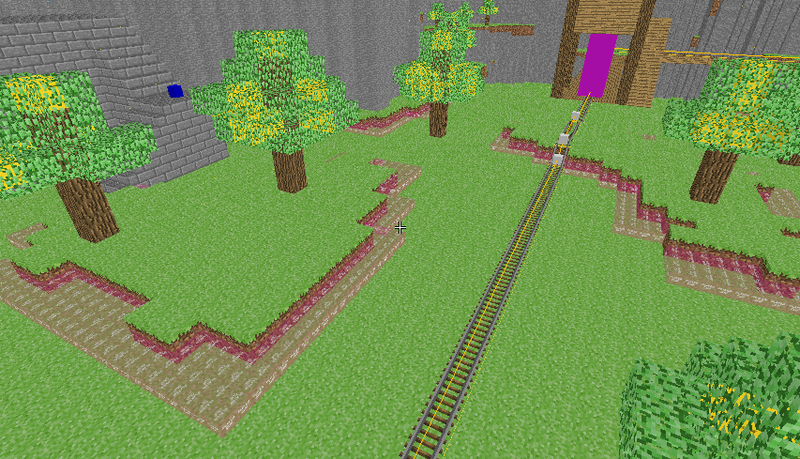 I find that when making a minecraft map it is best to use the block tool.